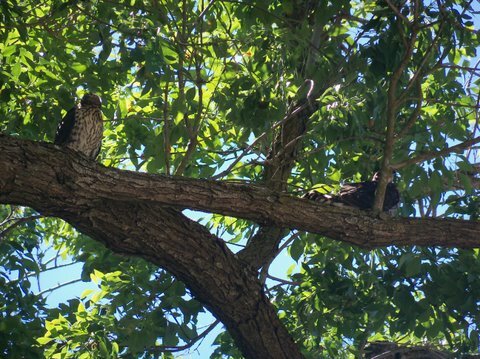 A family of 4 or 5 raptors has nested in Tahoe Park above the playground, and I need help identifying them. I’ll have to go back with a better camera, but in the meantime if anyone who has been there recently can shed some light, my kids and I would be grateful. All I know is it is not a red tailed hawk; we see enough of those to spot them. 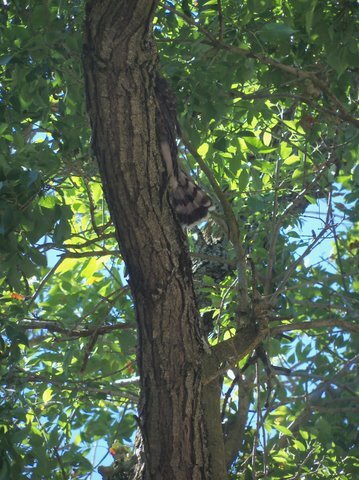 It is a small raptor with a white belly and grey back and hood, and a striped tail. I have concluded that they are Merlins, a small falcon breed that apparently is becoming common in urban areas. Whatever they are, they are neat! Today we found a bird carcass below the nest; I imagine one of them fell and died and stray dogs ate it? Or perhaps they killed and ate a pigeon–would birds do that? UPDATE Monday 1:00 PM: Mrs Cool and the kids snapped some awesome photos today, including some that add an air of mystery to the proceedings. And here is where things get interesting. 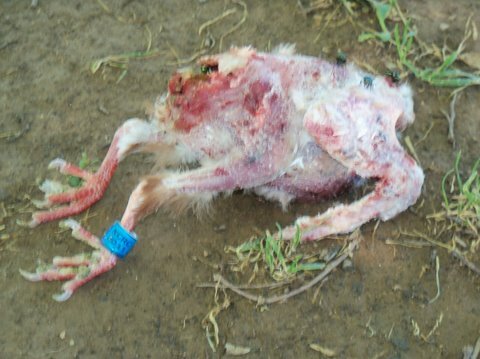 Another carcass was discovered, and this one was tagged! “NCRC 2011” I believe. What say you, raptor enthusiasts? Oh my gosh I kid you not at first I read, “whatever they are, they are meat!” and I was like, Whaaaaaa? But then I re-read and I agree now. Maybe someone at the Sacramento Zoo can confirm the breed. I Can’t seem to get a bigger picture of it. I got a couple raptor fanatics who could probably pick it out, but need a bigger pic. Hold on, let me consult my local ornithologist. I’m pretty sure these are Peregrine Falcons. They are the type of bird that eats other birds, and the park is basically filled with bird carcasses. 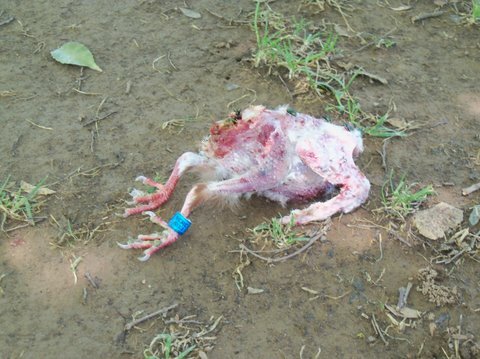 Bird carcasses make for the best fun when tied to a string and/or a kite (“What is that attached to your kite? A bird- I’m trying to teach him to fly.”). Glad I no longer have to find a carcass before going to the park now. Ooh that looks right! I knew they didn’t look like the red tailed hawks we see so often in the area but the cooper’s hawks photos look just right. Thanks! Previous Previous post: New bus terminal to be vagrant-free? Next Next post: Soundgarden. Wednesday. Going?